Morocco signed the Conventions on 26 July 1956, Additional Protocol I (Protection of Victims of International Armed Conflicts) and Additional Protocol II (Protection of Victims of Non-International Armed Conflicts) on 3 June 2011. Moreover, Morocco became signatory to the Convention for the Rights of the Child (CRC) on 21 June 1993, as well as the Optional Protocol to the CRC on 22 May 2002. Morocco has been member of the OIC since 1969, and the only fundamental ILO convention not ratified is that related to freedom of association (C087). On 7 November 1956, it became successor to the Convention and Protocol. Succession, in relation to multilateral treaties, means the State expressed its consent to be considered as bound thereby. The Convention on the Elimination of All Forms of Discrimination against Women – also called CEDAW, was approved during the General Assembly Session on 18 December, 1979 and entered into force on 3 September 1981. Morocco acceded to CEDAW on 21 June 1993. Through “accession” a state accepts the offer or the opportunity to become a party to a treaty, which has already negotiated and signed by other states. It has the same legal effect as ratification. Countries that have ratified or acceded CEDAW are legally bound to put its provisions into practice, and thereby agree to submit national reports on measures taken to comply with its obligations. Such reports are to be compiled at least every four years. Declarations were made regarding reservations against Article 2, condemning discrimination against women – provided it is in line with the Kingdom’s constitution and do not contradict Sharia or its derivative Moroccan Code of Personal Status; Article 15 (4), listing equality of freedom of movement can only be implemented if in accordance with the Personal Status code mentioned above; Article 9 (2), concerning children’s nationality – resulting from Moroccan law prescribing the mother’s nationality can only be carried over to the child of an unknown or stateless father; the provisions of Article 16, eliminating discrimination in marriage and family matters and child marriage – stating its incompatibility with Islamic Sharia, specifically paragraph (1c) regarding divorce. Additionally, Morocco considers itself as not bound to Article 29 (1), discussing dispute between states concerning interpretation or application of the Convention. It is noteworthy that Article 29 (2) specifically allows for such a reservation. The Convention on the Rights of Persons with Disabilities was approved during the General Assembly session on December 13, 2006 and came into force on May 3, 2008. Simultaneously, the Optional Protocol was approved, giving the Committee on the Rights of Persons with Disabilities (CRPD) competence to examine individual complaints with regard to alleged violations by States parties to the Protocol. The CRPD is the body of independent experts that monitors implementation of the Convention. Morocco signed the Convention on March 30, 2007 and ratified it on April 8, 2009 without any reservations. On the date of its ratification, it also acceded to the Optional Protocol. Morocco signed the Convention on January 8, 1986 and ratified it on June 21, 1993. It made reservations to Article 30 paragraph 1, referring to disputes between States related to interpretation or application of the Convention, stating it does not consider itself bound to the Article as allowed for per Article 30-2. On October 19, 2006 the Moroccan government declared its recognition of the Committee’s competences as per Article 22. The International Convention on the Protection of the Rights of All Migrant Workers and Members of their Families was approved by the General Assembly on December 18, 1990 and entered into force on July 1, 2003. Morocco signed the Convention on August 15, 1991 and ratified it on June 21, 1993. Reservation was made to Article 92-1 referring to disputes arising pertaining to interpretation or application of the Convention. Morocco noted it does not consider itself bound by this paragraph, as allowed for by Article 92-2. Morocco signed the Convention on September 18, 1967 and ratified it on December 18, 1970. It made a reservation upon accession regarding Article 22 and it not considering itself bound to its provisions, which pertain to inter-state dispute resulting from interpretation or implementation of the Convention, stating that all parties to the dispute are to expressly consent to intervention of the International Court of Justice. On October 19, 2006 Morocco declared its recognition of the competences of the Committee on the Elimination of Racial Discrimination in accordance with Article 14. The new Constitution (approved by referendum in 2012) specifically prohibits attacks on a person’s physical or moral integrity; cruel inhuman or degrading treatment; and torture (Article 22). Arbitrary detention and forced disappearances are prohibited. Everyone is guaranteed a presumption of innocence. Genocide and incitement to racism and violence are forbidden. The 1996 Constitution, which it replaced, was much more general, stating simply that no one could be arrested, imprisoned, or punished, except in accordance with the law (Article 10). The difference in content and wording is significant, because it represents a realization, since the beginning of the current King’s reign (1999), that the record of human rights in Morocco is a dark one. 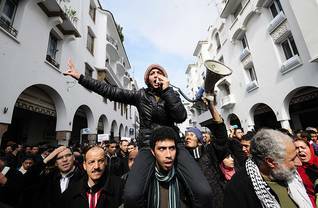 During the ‘years of lead’ from the 1960s to the late 1980s, the Moroccan government was known for extreme repression of its opponents, who were initially left-wingers and later Islamists. The most important leftist leader, Mehdi Ben Barka, was exiled to Paris, where he was kidnapped and assassinated in 1965. 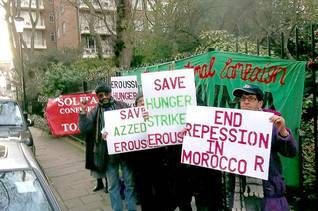 The repression became particularly severe after the attempted coups in the early 1970s, and a Moroccan gulag was established. Among the most celebrated prisoners were the family of the regime’s former internal-security chief and Interior Minister, Mohammed Oufkir, who was himself accused of participating in the 1972 coup and died immediately afterwards. According to his family, he was executed by the regime, although official sources claimed that he committed suicide. His family was arrested and imprisoned in secret camps in the desert until their release in 1991, following European pressure. Other participants in the coup were held, along with later victims, in a secret prison at Tazmamart, in the Atlas mountains, where conditions were extraordinarily harsh. In the final years of King Hassan II’s reign, the repression lessened, and prisoners were released. Many wrote books describing their experiences. After he came to the throne, King Mohammed VI responded to the growing pressure for abuses to be exposed, and he established the Equity and Reconciliation Commission in January 2004. It was set up to investigate forced disappearances and arbitrary detention between 1956 and 1999, to rule on reparations, and to determine ‘the responsibility of the state agencies or any other party’. Its final report was released to the public in December 2005, but its findings were muted. No public officials have ever been charged, but extensive compensation was ordered. Most importantly, the commission recommended the creation of new mechanisms to protect human rights. This led to the establishment of an independent Council on Human Rights, but some of the commission’s other recommendations – ending the death penalty and ratifying the statute of the International Criminal Court, for instance – have not been carried out. 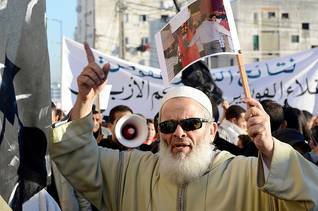 Morocco’s record on human rights has not been reformed as much as the public investigation of past abuses suggests. In 2012 Human Rights Watch continued to report arbitrary arrests and the use of torture. Human-rights activists are at risk of arrest and imprisonment for long periods after trial. Investigative journalism is curtailed when its criticisms of the government are judged excessive. 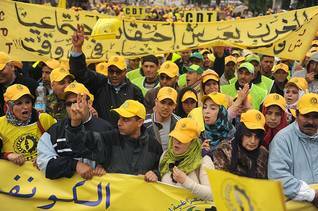 Pressure for human-rights reform continued during the Arab Spring movement of 2011 and led to the formulation of the human-rights provisions of the new Constitution.